Slice the bananas and strawberries. Pour in a glass bowl. Let it rest for 2 minutes. 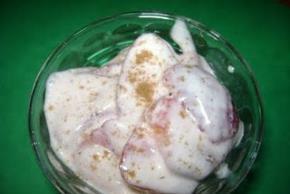 In a separate bowl combine the sour cream, sugar, ginger and cinnamon. Whisk until sugar is dissolved. Add mixture to the bananas and strawberries. Chill for 10 minutes and ready to enjoy.